HomeUncategorizedBongs vs Blunts: What Are the Benefits of Smoking With a Bong? Bongs vs Blunts: What Are the Benefits of Smoking With a Bong? 4 Will You Add a Bong to Your Rotation? Marijuana, pot, weed: No matter what you call it, the majority of Americans have smoked it at least once. For those who love smoking on the regular, though, the delivery method merits some consideration. Are you smoking in the best possible way? Today, there are countless different options for consuming weed, but smoking remains a classic favorite. It’s easy to see why: you get fast results and can regulate how high you get with no trouble. But there are actually some benefits to using certain smoking methods over others. Do you know all the benefits of using a bong? If not, we’re here to help — keep reading to learn more! 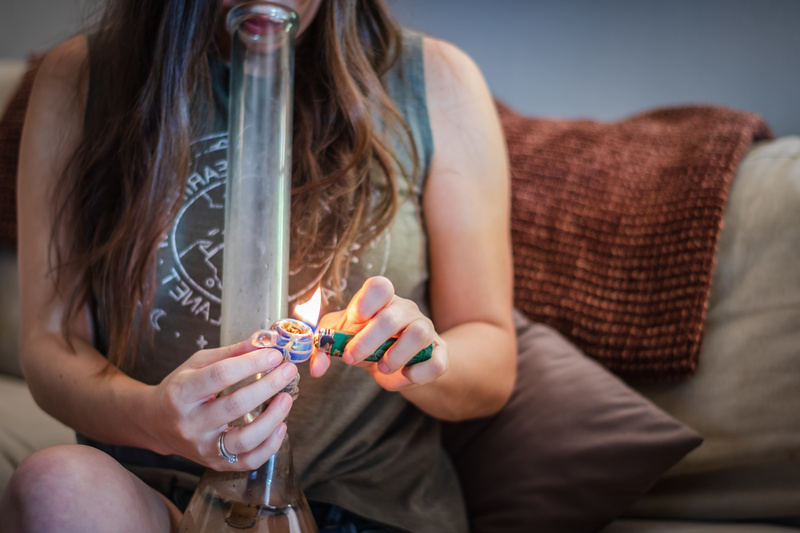 Even if you love a certain smoking method, like joints or bubblers, there are good reasons to work bong use into your rotation at least sometimes. Let’s take a look at why. If you avoid glassware because you think the maintenance will be too difficult, stop worrying: caring for a bong is actually super-easy. The main thing is to make sure you change out the bong water each time you use it. Otherwise, you’ll quickly notice the water changing colors and textures as it goes bad. You should also take apart your bong and scrub down the parts with a mild soap every so often. That’s all you need to do to keep your bong hitting smoothly! The water in a bong goes bad so quickly because it actually helps filter the smoke, giving you a cleaner hit. When you use clean water each time, you’ll get maximum filtration, and a more pure taste of the flower. The water also helps cool down the smoke, which is why bong hits often feel so smooth. If you want a cooler hit, try a bong with an icecatcher, which lets the smoke pass through ice cubes before it reaches your mouth. Want even more filtration? Try adding an ashcatcher attachment to your bong. These simple accessories filter the smoke through one more layer, and trap any ash before it can get into your bong. Some of the modern, popular ways of consuming weed (like dabs) can be seriously daunting for a beginner. Even experienced smokers may not always want to put a ton of effort into taking a hit. But bongs are always easy to use so nothing gets in between you and your high. They’re also relatively inexpensive to use. Once you get the bong, you don’t need to invest a lot in accessories or maintenance, and you can get the most out of even cheap weed. Many smokers love bongs simply because of the way they look. When you’re not using it, a nicely-made bong can also become a beautiful accessory for your home. Bongs should always be made out of glass (never plastic or metal) so nothing from the bong itself can contaminate the smoke. But because they’re made of glass, they often have a lovely sculptural appeal. If you want to see some examples, shop now! Haven’t tried a bong yet? They’re easy to use, but this guide will help you get started. First, let’s go over the basic parts that comprise a bong and what each of them does. The base is the main thing you’ll usually notice when you first look at a bong. The bottom of the bong often gives it that artistic, sculptural look — almost like a vase. The base is where the water goes in most bongs. The tube makes up the other main part of the bong that you’ll notice at first glance. The long mouthpiece contributes to the vase-like appearance of these contraptions. The smoke runs through the tube after getting filtered through the water. You’ll also find certain accessories, like an icecatcher, in the tube of some bongs. The bowl is where your dried flower or other smokeable cannabis product will go. Many bongs have removable bowls. The downstem connects the bowl to the base of the bong. The smoke travels from the bowl through the downstem to reach the water. Finally, the carb is the hole that allows you to inhale all the smoke in the tube. Many bongs incorporate the carb into the bowl design. When you remove the bowl, it creates a hole that lets you pull the smoke through the chamber. Now, let’s look at how these parts work together to get you high. Just follow these steps before using a bong for the first time! Your first step is always adding clean, fresh water to the base of your bong. Even if the water still looks fine from last time, change it out to get the best-tasting hits. You’ll also need to pay close attention to the water level — otherwise, the water will bubble up into your mouth when you try to take a hit. Start with the water just above the downstem, and adjust levels as needed. Now, you can add your flower (or any dried, smokable form of marijuana) to the bowl. Don’t pack the bowl to tightly, otherwise your hit won’t be even. Also, keep in mind that hits from a bong tend to be strong. Start with a small bowl at first! Light the bowl while taking a pull. When you see smoke go into the tube, take out the bowl to open up the carb so you can inhale completely. The longer you pull before opening the carb, the bigger the hit. Will You Add a Bong to Your Rotation? Smoking through a water bong remains one of the most popular ways to use weed, for good reason. It may be low-tech, but this classic smoking method delivers great results every time. Even if you don’t use it each time you smoke, investing in a bong will give you a great new option for getting a nice high. Interested in more than getting high? Marijuana also contains compounds that have plenty of health benefits — learn more here.